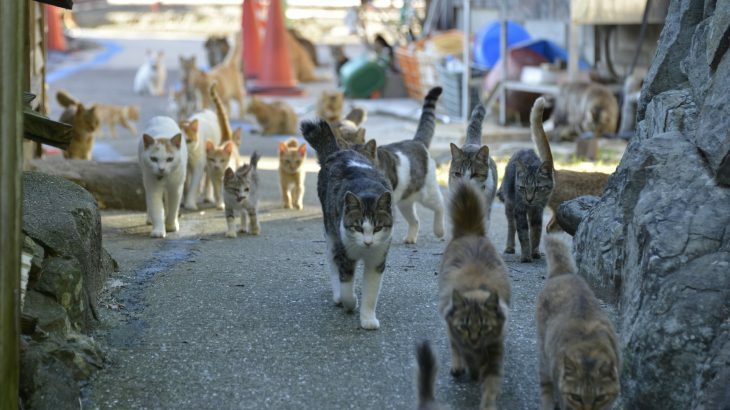 Cat Island, otherwise known as Aoshima, Japan, became a social media sensation a few years ago as a result of its vast number of cat inhabitants. With over one hundred cats on the island, cats outnumber people six to one. Aoshima is a mile-long, unpretentious fishing island, previously unknown to travelers. But then cats were introduced onto the island to help reduce the mice population. Without proper spay/neuter programs in place, the cat population and, subsequently, the number of tourists grew. Aoshima is not the only tourist destination beloved for their cat population; places such as Athens and Jerusalem are also known for their feline companions. While the cats can be seen as a unique way to bring tourists into an area, their welfare may be jeopardized without the necessary care. An animal activist who visited Aoshima observed cats living in a worrying state. According to her post on Chewy.com, roughly one-third of the cats were young kittens with untreated upper respiratory infections. She notes that the locals have adopted a hands-off approach towards the cats, preferring for nature to take its course rather than provide the cats with medical care. A three-year study of outdoor cats living in Onomichi, Japan also found a high number of cats living in poor health. In the first year of research, half the outdoor cats were in poor physical condition. By the third year, many of the cats living in poor conditions had disappeared, likely dying from illness. Travelers who quickly visit the cats for a few photos before heading on to the next attraction may not pick up on the signs of poor welfare. Additionally, the sick cats may hide from tourists while the healthy cats socialize, distorting tourists’ perceptions of the cats’ welfare. If travelers do see cats in a distressed state, they may be disheartened by the experience and be less likely to visit the destination again, research shows. But, the situation does not have to be so murky. Communities can embrace the outdoor cats as a tourist attraction to better enable them to care for the animals. The small, mystical town of Kotor, Montenegro is home to many outdoor cats who are often found lounging on the cobbled streets. The locals have welcomed the cats and travelers can find plenty of cat souvenirs sold at shops across the town. Kotor even has a cat museum that showcases items such as cat artifacts and postcards. The small admission fee is used to feed and care for the cats. For residents of Kotor, the cats seem to bring a sense of pride and community. They are even considered a symbol of the city by some. “The cats all look healthy, well-cared for – not what you would imagine from strays. On closer inspection, you can spot bowls of food and water left by shop owners and restaurant staff, and you can find the most confident cats lounging on the laps of tourists, purring for affection,” Culture Trip notes. In Kotor, cats and tourism are intertwined in a way that benefits both the travelers and locals. But not all relationships between cats and tourism are positive. In some cases, outdoor cats may clash with tourists. The beachside resort El Dorado Royale in Mexico had a large number of cats who hung out around the resort. Guests began to complain about the cats howling at night and acting bold, according to Fear Free Happy Homes. In the face of this tricky situation, the resort took a creative route. They spayed and neutered the cats to control the population and invited a local animal welfare organization to open up a cat café at the resort. The cats even received their own bungalows modeled after the hotel rooms at the resort. As for the cats on the island of Aoshima, local papers reported last year that the cats were being cared for by an animal welfare organization and the city had designated funds for spay and neuter.